6 reels, all ways, built by WMS Software and has a free spin game that can be retriggered while within the free spin feature. We think that pretty much sums it up! 6 reels and 4,096 paylines, it’s almost like it is impossible to lose! Anyway, the theme here is clearly African with a bunch of savannah themed graphics. 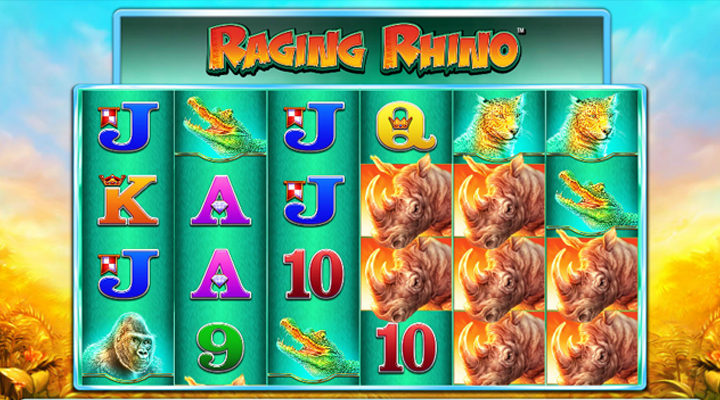 Raging Rhino comes to us from WMS Software and was made with the intention to be easy to play. The bright colors and high quality graphics make it a pleasure to look at as well. With this one, we’re looking at primarily the free spins feature which will definitely provide for some nail biting moments. As you may have guessed, the jackpot symbol here is gonna be the rhino and getting 6 of these will net you a decent win - well - if you didn’t bet the bare minimum, that is. Aside from the jackpot symbol, you’ll want to get as many diamonds as you can. From three you’ll start getting a scatter bonus and it’ll also trigger the free spin portion of the slot. We’ve been hinting at it, and here it is: a free spin that is retriggerable! So when you get at least three diamonds, you’ll start triggering the freespin feature. If, while in the free spin feature, you get more diamonds - you’ll trigger more free spins. This is potentially a never ending process that could net you some epic wins. Simple, unique, and looks great. What more could we want? Hm, we can’t really think of anything off the tops of our heads. The free spin figure is really going to get your blood pressure going from all the excitement and potential big wins at every spin. Click here and see how many free spins you can trigger!